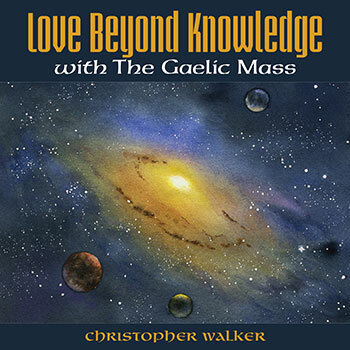 Inspired by the unique vocal stylings of Gaelic music, Christopher Walker has created powerful hymns and a striking mass setting. Each song highlights his signature blend of strong vocals, accompanied by flutes, violins and horns; a style that is instantly recognizable amongst parishes across the U.S. His music promotes community and growth through the grace of God, and he has provided musical variations meant to accommodate the needs of any parish. In collaboration with Paule Freeburg, DC "Be Still and Know That I Am God" encourages us to slow down and examine our lives. The purposefully simplistic lyrics are counterpointed by flowing vocal harmonies and piano arpeggios; perfect for moments of meditation and contemplation. "Lord, Let Me Love You More and More" was written by renowned hymnodist James Quinn, SJ. His lyrics, while straightforward, are fully utilized in this SATB choral arrangement. "The Serenity Prayer" can be used as an aid to recovery through times of strife. It provides us with Christ's love and comfort when we need it most. Plus these tracks are not strictly limited to the liturgy, but can enhance your worship experience at a group retreat, communal gathering or bible study as well. If you loved Christopher Walker's Celtic Mass, then you'll love this new collection; composed of flowing melodies and spacious harmonies. While the two settings are stylistically similar, this new adaptation lingers on soft notes, slowing down rhythm and allowing flutes and violins to wander. It can also be sung in unison or SATB, offering versatility for your choir and assembly. Find more octavos for the Gaelic Mass here.